Blarney, Shenanigans and 17 Irish Wolfhounds on the St Patrick’s Day Parade! — The Irish Wolfhound Charitable Trust: Charity No. 1169412. Blarney, Shenanigans and 17 Irish Wolfhounds on the St Patrick’s Day Parade! 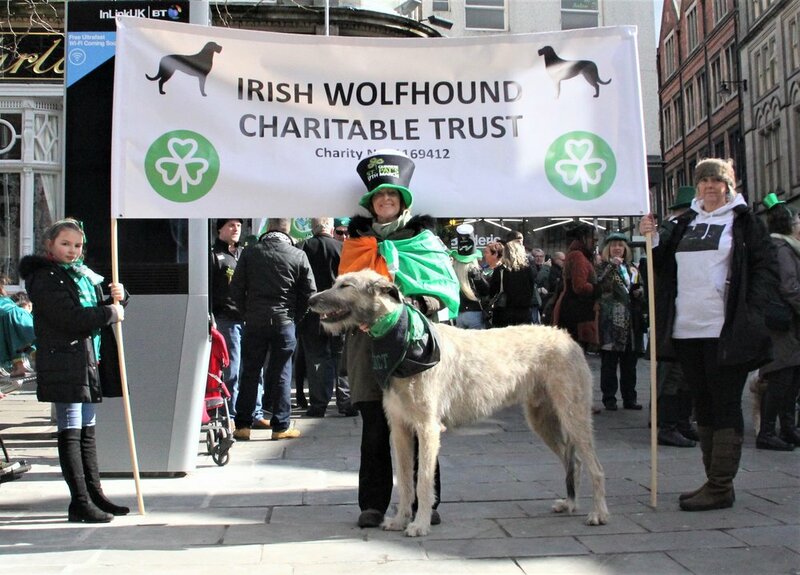 For the 2019 parade, the Nottingham St Patrick’s Day Festival and Parade Committee nominated the Irish Wolfhound Charitable Trust to be their designated charity. This was a huge privilege for the IWCT and the Charity Trustees and supporters were thrilled to take part in, what was, the 20th Nottingham parade. The Festival programme started on the Monday before the day of the parade with the Lord Mayor and the Sheriff of Nottingham presenting shamrocks to 2 of the IWCT trustees and hounds on the steps of the Council House. The breed was then very well represented the following Sunday with 17 Irish Wolfhounds (and a beautiful Irish Water Spaniel) leading the St Patrick’s Day Parade through the centre of Nottingham and culminating in the Old Market Square. The IWCT also had a stall near to the central stage in the Square with information about the objectives and work of the Charity and with an array of banners, flags, badges, balloons and photos of Wolfhounds in action. Many owners know, from previous experience, that the Wolfhounds are always extremely popular and draw in crowds on the day and this year’s Parade was no exception with lots of interest in all aspects of the breed and their vulnerable status as an ‘at risk’ native breed. The Nottingham festivities carried on all day with bands and dancers performing on the central stage and members of the Irish community from all walks of life coming along to join in the fun and some of the fancy dress costumes you really had to take your hat off to, quite literally! As the designated charity, the IWCT were permitted to conduct a street collection from the crowds on the day and the collection buckets raised a staggering £554.48. Along with online donations (through the IWCT website and Facebook page) and private donations of ‘loose change tins’ the final grand total for the event was an amazing £741.29. The IWCT would like to thank everyone that supported the event, especially the owners that brought their beautiful hounds along and also a huge thank you to all our donors. In addition, the Trustees would like to extend a personal vote of thanks to Sue at Drool Catchers Dog Bibs for making the fabulous IWCT bib bandanas for the hounds to wear on the parade. Finally, our gratitude to the St Patrick’s Day Committee for inviting us to be the designated charity and for enabling us to be an integral part of such a memorable event.